I really can't believe that it's been over three years since I've cooked stuffed peppers in any manner, let alone on the grill. Now that fall is thankfully upon us (I love fall), I thought it high time that I revisit and revise my previous recipe. Note: I apologize profusely for the pictures of my last stuffed pepper outing. Can you tell that those were the early days of the blog? Oy! Let's all pretend that never happened, OK? Besides, this recipe blows the doors and roof off of those. My wife's comment about these was, "These are the best thing that you've made in a long time." That's high praise, but it makes me wonder about everything that I've cooked in the intervening "long time". Oh well... I'm sure she was just over-exaggerating. Heat a large saute pan over medium-high heat, then add the oil. Add the onions to the pan and saute three minutes, or until barely translucent. Add the mushrooms, garlic salt, pepper, and Worcestershire sauce. Saute five minutes. Add the tomatoes and saute three minutes more. Remove the mixture from the pan, set aside and let cool. Return the pan to the heat and add the beef, pork, and Montreal seasoning. Cook until the meat is lightly browned. Do not drain the liquid! Remove the pan from the heat, cover, and set aside. While your grill is starting, cut the side or top off of each pepper (about 3/4"), and remove the veins and seeds. Add the mushroom and onion mixture to the meat, add 1 1/2 cup of the cheese and stir to combine. 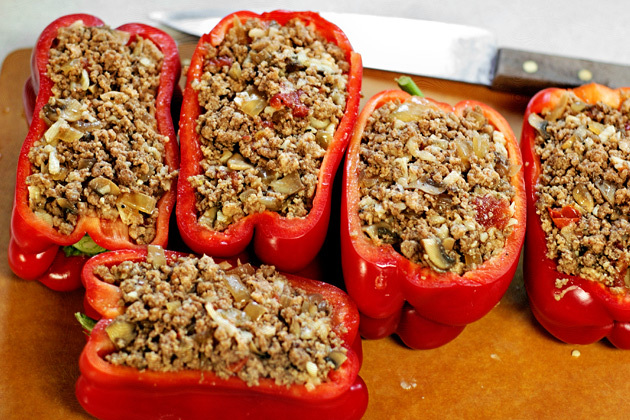 Fill each pepper with the filling until it's just barely mounded over the top of the pepper. Grill the peppers indirect for 45 minutes. 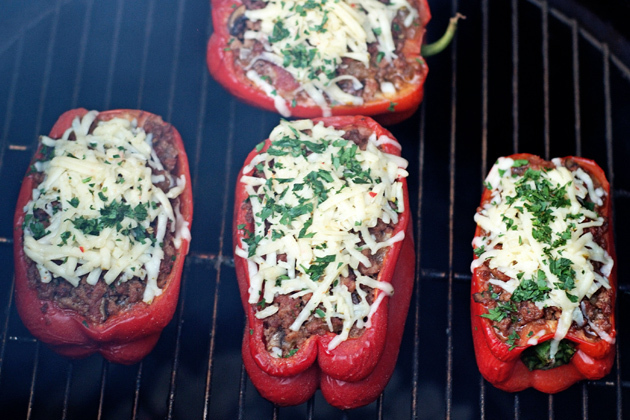 Top each of the peppers with an equal amount of the remaining grated cheese and the parsley. Cook the peppers 15 minutes longer, or until the cheese is nicely melted. Remove the peppers to a platter, tent loosely with foil and let cool five minutes. What peppers? ?....What old photo??? :) I look back at some of my old photos in 09 and wonder what I was thinking. Actually yours was pretty darn good in comparison. I'll keep this recipe. I've decided crimini are my favorite every day mushrooms. I really like the flavor. And like the touch of worcestershire in this. The only good recipe I have is for Italian Stuffed Peppers. And it's probably been two years since I've made those. These look wonderful. Definitely going on my "to- make" list. Thanks for sharing! yeah, I cringe when I go back and see the early days photos on my blog. I've actually reshot and replaced a few that I was so horrified by. Like I said on the BBQ Brethren, looks like you nailed this one John. 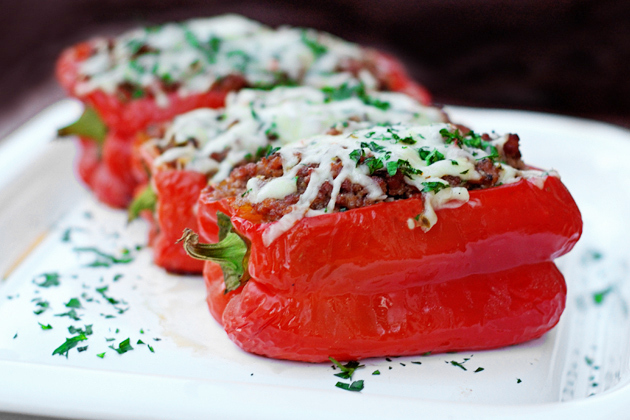 Stuffed peppers are the best. Yours are a bit different than mine so I can't wait to try this recipe out. Most I see are similar enough to mine that I won't bother but yours are something different! I know we won't be disappointed. Just hope it won't be "the best thing in a long time" ha ha. Seriously, these were delicious! Mushroom lovers will adore them! Chris - I appreciate your usual kind words. Please let me know what you think of this latest incarnation. Hubby was supposed to make his stuffed peppers last night, then got stuck at work late. I used your recipe and grilled them over charcoal. I've now been appointed the official stuffed pepper maker of the family. So... Thanks, I guess. These were fantastic and I'm sure they'll be in the regular rotation a lot this summer! Jess - Thanks so much for your very gracious comment. I'm truly glad that you and your family enjoyed the recipe.